There’s no denying that breakfast is big business. 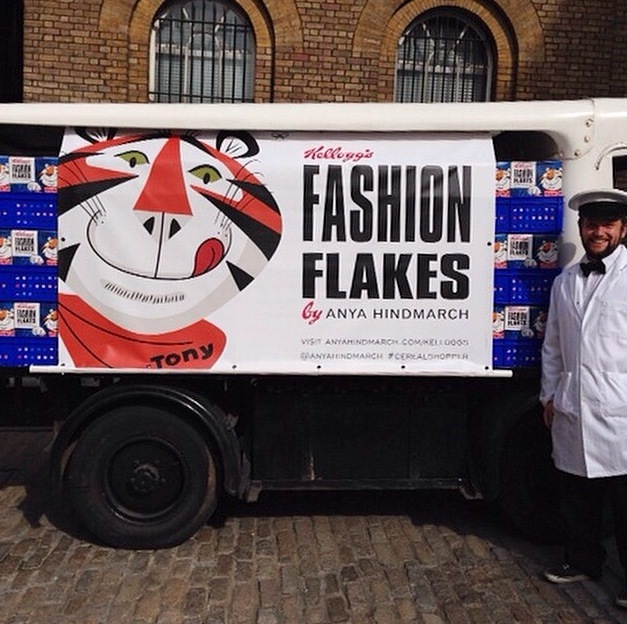 We’ve just seen fashion designer Anya Hindmarch give Kellogg’s Tony the Tiger a grrreat makeover and Shoreditch is awaiting the launch of its first Cereal Killer Café next month. So, it’s no surprise that celebrities are chewing their right arms off to be associated with the most important meal of the day – becoming part of everyone’s morning routine in the process. And, the king of R&B, Usher, is no exception. He’s partnered with Cheerios and Walmart in the US to give away his latest track – Clueless – with every box of Honey Nut Cheerios. On the outside looking in, this brand partnership doesn’t seem to make any sense. 36-year old Usher, who has come a long way from his You Make Me Wanna days, doesn’t fit Cheerios’ target market – a cereal championed by a bee called Buzz. But, once you’ve swallowed this fact and digested the promotional video that accompanies the PR and marketing stunt (don’t knock it before you’ve tried it – it’s already secured 820,000+ views), it becomes the entire reason why Usher has taken this on. 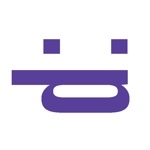 With super fans downloading One Direction and Justin Bieber tracks left, right and centre, how does an ‘experienced’ singer steal back sales and kudos? By ending up in the hands of millions of young digital eagles across the country, giving them a unique code to download a fresh track of course! Essentially, it’s a win-win situation. Usher gets the downloads he needs ahead of an upcoming album launch and Cheerios gets to negotiate premium shelf space with Walmart, while producing some crunchy content for its communications channels. But, how could this partnership develop in the long-term? 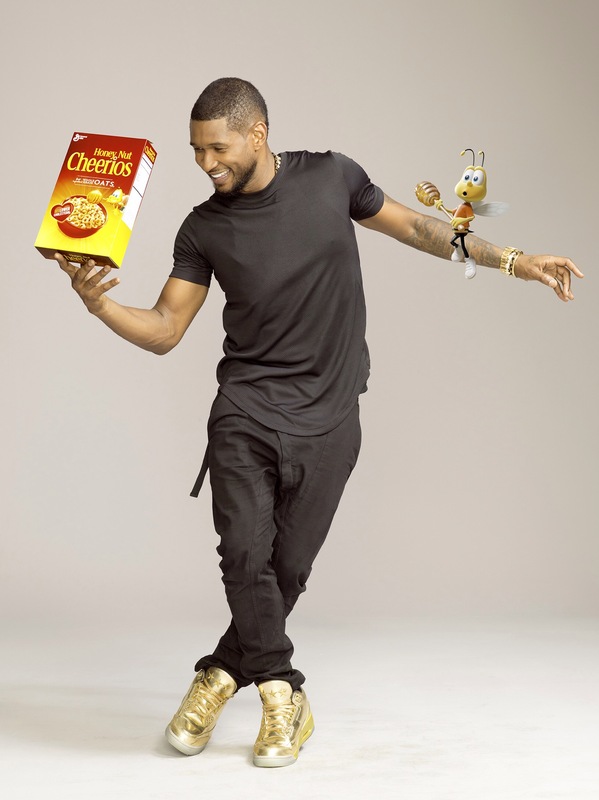 Some ways that Cheerios could maximise its partnership with Usher include subtle branding in his next video; utilising his 9m+ followers by hosting a Twitter takeover and running a competition to meet the star himself; or creating a series of educational videos on the importance of breakfast with Usher’s children, linking in with Cheerios’ Family Breakfast Project. So, it’s a good start, but there’s lots more Cheerios could be doing to transform this fleeting stunt into a considered campaign. 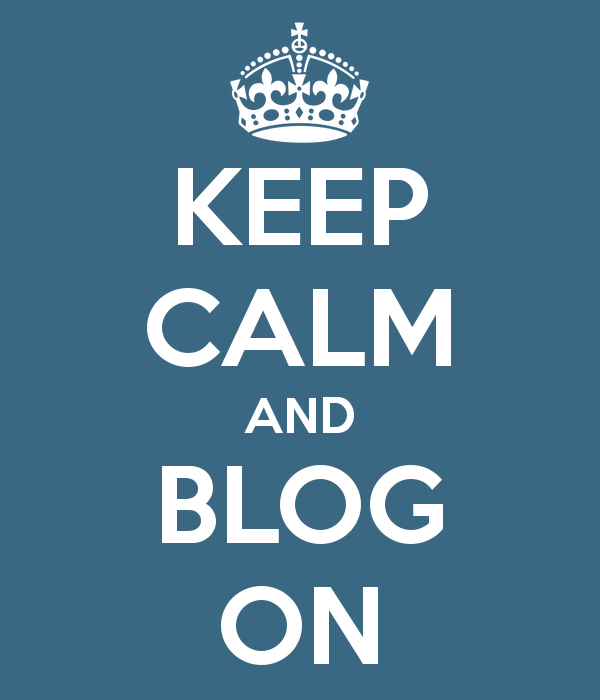 If you didn’t fancy a bowl of Kellogg’s finest before reading this blog, you will now. Thanks to fashion designer Anya Hindmarch – the woman behind the ‘I’m Not a Plastic Bag’ campaign – the latest trend is vintage-inspired accessories that pay homage to big brands. From Ariel washing powder clutches and Custard Cream purses to Rich Tea baguettes and Coco Pops totes, this collection has hit the shelves at a time when demand for nostalgic kitsch has almost hit the roof. And one in particular has caught my eye – Frosties. Having been inspired to develop the limited edition Fashion Flakes range as part of her Counter Culture collection – inspired by her passion for making the ordinary, extraordinary – the bags are exclusive to her stores in London and Paris, instantly making it a sought-after product. But, so not to put the products on a pedestal, Anya’s cleverly employed the use of social media to create a buzz – making these luxury items seem attainable to the average cereal eater. 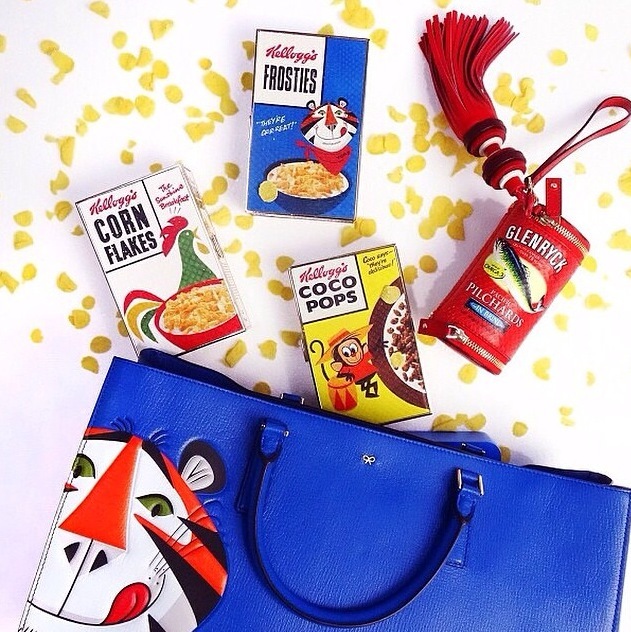 Fans are being encouraged to post images or films on Instagram, tagging @anyahindmarch with the hashtag #cerealshopper for the chance to win a £1,350 bag. With each Instagram post featuring the collection – or the Frosties-themed milk float, which formed part of a PR photo-call where cereal was handed out during London Fashion a Week – reaching 57,000 followers and generating in the region of 1,000 likes, it’s by far the best platform for the designer to show off. But, what does Kellogg’s get in return for loaning out its family favourite brand I hear you ask? Well, whether you’re a collector or just like your cereal boxes with a pinch of class, you can get your hands on a redesigned Frosties box for a respectable £3 (the same calibre high-end creation at the snippet of the price). Of course, Tony the Tiger is holding one of Anya’s bags as an extra plug, but on the whole the metro (modern vs retro) interpretation looks good and gives Kellogg’s some new content for its comms channels – something a 100+ year old brand must be desperate for. It’s also been able to share the love with Waitrose where the chic cereal will be available for a short period. So, as you can see, two totally different brands from different sectors and with different audiences (the proportion of women with Anya’s luxury handbags who eat Frosties is considerably small, or so I assume) can successfully work together. Do you agree? What element of the partnership do you think tastes grrreat?